About a year ago, shortly after the March for Science, I wrote a three part series on living as a scienitst in a post-fact world (how we got there, why humans rarely use facts to decide what to believe, and why/how scientists should engage with policy). Peter Adler wrote a spirited rebuttal “Response to a post-fact world: in defense of the honest broker“. I responded at the time in the comments. But Meghan’s recent review of the Merchants of Doubt got me thinking about this again. So did an opportunity to shadow my representative in the Maine legislature for a day with my son. During that day I was introduced to one of only two scientists in that body out of 185 people (House + Senate).The two main topics of debate, solar energy fees and legalizing marijuana, both had substantial areas where science could have been informative, but seemed to have little to no impact on the debate, and for that matter the debate seemed to have little to no impact on the actual outcome. Rational discussion of facts is not really how policy gets made. So I want to return to my post-fact world claim that scientists need to become more engaged in policy and Peter’s rebuttal. In particular, I want to suggest that scientists get so muddled in how to relate to policy because we confuse two separate axes. Honesty vs ends-justify-means axis – this axis is about how we approach discussions. Do we always wear our scientific hats, carefully distinguishing what is well established and evidence based from what is speculation? Are we cautious in overclaiming? Or do we act like many actors in the policy arena (be it partisan politicians, lobbyists or lawyers in a court case) who are actually paid to be push a specific outcome and to pick and choose and exaggerate the lines of argument that support their side? Passive vs active dissemination axis – this axis is about how much energy we as scientists devote to getting the scientific perspective into the policy making domain. Do we publish a paper in a scientific journal and figure that is enough? Or do we write editorials in newspapers? Go visit legislative committees and legislators and government scientists and managers (all of whom are much more accessible than one would think in many states)? Or run for office ones self? I would suggest that most arguments against scientists getting involved conflate these two axes. If we are actively disseminating the scientific perspective, then we must be no-holds-barred unobjective. This of course is manifestly not true. The more important question is whether others in the policy realm can perceive the distinction between these two axes. It may be convenient for adversaries to intentionally conflate these (e.g. the defender of a polluting company notes that the expert witness on the biological impacts receives grant money so he is not objective), but I believe that in fact most of the actual decision makers (not the arguers on the edges like lawyers and lobbyists) can indeed distinguish the two. If I am talking to a legislator does that make that make her more or less likely to trust my opinions? Every study out there shows that beliefs are largely adopted through social processes, so it actually makes me more likely to be believed. Let me rephrase that in my terminology – being engaged and active in disseminating science does NOT make people think we’re used car salesmen adopting an ends-justify-the-means approach. People can distinguish dishonesty from reaching out to communicate. And indeed given the social nature of belief-building, reaching out actually increases the likelihood of being perceived as credible. This was the essence of my call in my post in scientists needing to engage. We don’t need to exaggerate and cherry-pick and lose objectivity. I agree that deeply harms science. We indubitably need to stick to the honesty side of that axis. Rather my call was a need to move from passive to active on the engagement side. First – I should note that three of these labels are borrowed from elsewhere in the literature. 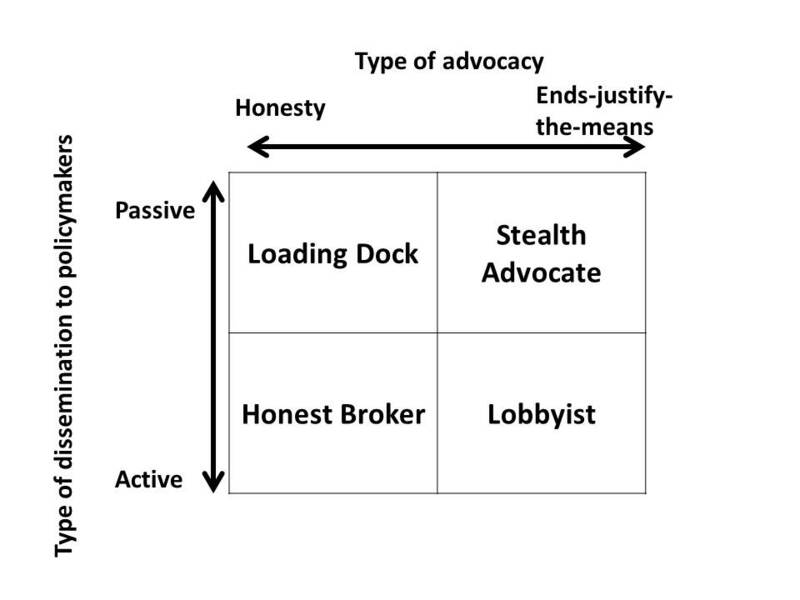 “Honest Broker” and “Stealth Advocate” both come from Roger Pielke Jr’s book entitled the Honest Broker: Making Sense of Science in Policy and Politics. It is an excellent and important book on this topic. He has his own 2×2 classification that differs from mine (and honest broker is one quadrant and stealth advocate is outside his four quadrants). But I think/hope I am using these two terms in a way that doesn’t do damage to his ideas. The phrase “loading dock” comes from papers by Cash (e.g.) who is also really well worth reading for those interested in this area. Like Pielke I think (and I think most think) that the most feared and damaging category for science is the “Stealth Advocate”. The person who pretends to wear the label of objectivity and scientific approach while actually adopting a no-holds-barred, ends-justify-the-means cherry-pick, exaggerate and distort the science and the degree of scientific certainty approach. This is what everybody who tells scientists not to become advocates fear. But I think its interesting to note that while lobbyists do not enjoy stellar reputations, nobody fears them or sees them as damaging the credibility of a position because they are transparent about their intentions. A stealth advocate is way worse than a paid, licensed advocate. Given the fear of stealth advocacy and the resulting proclivity for scientists to “stay at home” in the top left corner, I think it is worth examining that model. Cash justifiably calls this the “loading dock” mentality. All I have to do is publish great and policy-relevant science and the policy-makers will back up to my loading dock to take it away. Umm, no! They don’t read our journals. The lobbyists who translate science for them don’t read our journals (and in any case are transparently cherry-picking favorable arguments, not accurately representing the state of scientific consensus). Living in this box is pretty much equivalent to be willing to have no impact on the policy process. Which brings me to the “Honest Broker” role. I don’t conceive this role exactly like Pielke. But I think it is powerful label that not coincidentally exactly describes its position in this 2-D coordinate space. Honest=left column. Check. Broker inherently means somebody who is active and engaging and connecting and spanning into the policy arena. So bottom left box. Check! A graduate student presenting at ecolunch today made a genius statement that I thought marvelously cut through the dilemna. She works in agriculture and I asked her how her science ends up impacting farmers. And she said “well farmers believe other farmers more than scientists, but if we can identify an influential farmer in the community and run the experiment with them and they see the improved yields with their own eyes, other farmers will believe them. That is way more influential than publishing a paper.” Does using that active (and yes very calculated) approach to dissemination make the science more or less likely to be used? I’m pretty sure you know the answer. So when I say scientists need to become more engaged, this is the role I have in mind. Be openly and actively engaging with policy. Be openly and actively (aka get out of your office and talk) to stakeholders and policy makers. Think about the best way to influence policy. But keep your science hat on. It is doable. Policy makers recognize and respect that role. And it is by far the most effective box to have a role on policy. So to briefly recap what it means to be more engaged (I don’t think I need to recap what it means to remain scientific!) it pretty much boils down to activities that get outside of academia. Writing to local newspapers. Giving presentations at garden or fishing clubs.Talk to people “in the real world”. IE engage with stakeholders. Be crafty like the graduate student above. Ask for appointments with your state representatives and the chairs of committees relevant to your science and drive to the state capital. If you’re in DC ask to meet with your congressional representatives. Run for office (even local office). But please keep your science hat on. Don’t become a stealth advocate. What do you think? Is it possible to separate on these two axes? I fear that biophysical scientists are a little too prone to think that their brilliance and subject expertise and intuition are all they need to be effective in the policy arena. While as you say this is a heavily researched subject. If we want to be evidence-based we ought to use evidence-based best practices in outreach and policy. Social psychology is certainly one important field. Environmental communications is another. Human dimensions in wildlife and forestry departments is another. And science-policy is yet another relevant field. All of these overlap but add useful unique perspectives. Brian, I won’t be writing a rebuttal to this post, I agree with everything you said. My only follow-up thought is that it might be nice to show some examples of how to engage–how to write those letters to the editor–from an honest broker rather than stealth advocate or lobbyist position. We are so used to seeing polemics, and the media is so saturated with he-said-she-said arguments, that it is hard for me to think of good examples off the top of my head. Perhaps statements like “I am just raising awareness about this problem, but it’s not my job to decide how society should address it” might help. Presenting evidence on either side of an issue, or recognizing gaps in evidence or understanding, might be another way to differentiate oneself as an honest broker. Do you have specific examples in mind? Good point about specific examples. I’ll try to think of some for a future post. 2) Is honest about the degree of certainty (and uncertainty). Of course how one does this depends a lot on the audience and communication medium. Overemphasizing uncertainty in a 30 second TV clip can be a kiss of death (as satirized in Randy Olson’s movie Sizzle: http://www.randyolsonproductions.com/movies/sizzle/index.html). In those cases, yes I think simple phrases like “current best evidence” can be enough. But if you’ve got 15 minutes with a legislator or 800 words on an op ed page I think you can do better. I think your phrase about raising awareness is good too. I think “The science is not 100% certain but I’m going to present the best available evidence across X papers.” is a good one. So is “I’m presenting the scientific prediction about what will happen if we continue on the current path, but I recognize that other factors like impacts to humans are important too in making the final decision” is a big one. Looking like an aloof scientists who cares more about insects or snails than humans is a pretty quick route to dismissal. A very specific (but big) example I have in mind is the IPCC (intergovernmental panel on climate change). I’m sure this will be controversial. But my perception is that reports 1-3 were very careful to stay on the left side of the diagram. There was a lot of caution in interpretation of partial evidence and careful use of low/medium/high uncertainty classifications. But – my perception – IPCC 4 crossed the line out of the strictly objective scientist role. They included some rather fantastical reports about the Himalayan (if I recall correctly) glaciers melting in a few decades that were in the scientific literature but far from scientific consensus and later used to ridicule the report. They were less cautious about their certainty levels too. And I think they undid a decade plus of being seen as an honest broker and moving to a stealth advocate in a way that can never be undone. Agree completely with all said. I think one of the issues why this is becoming relevant nowadays concerns the general polarisation in politics. We have lost the political spectrum of individuals holding their own ideas across the political spectrum; some right, some left, some liberal, some conservative (at least within political representatives). There is very little room for this kind of individual expression, as there is more and more the tendency to have to walk party line. When this happens the whole process of objective truth becomes irrelevant and the truth is made for you. If a scientist can help you make this truth, even better, but the policymakers do not care anymore. The usual greyness and complexity of the world is replaced by a black and white world of simple and fast solutions … and they sell a lot better! I do therefore agree that scientist have to engage more but …. in some way we have to show that the world is still grey and we definitely have to sell the few slithers of black and white that are still out there. I equally think that there is a certain amount of dogmatic thinking getting into science as well, equally in ecology. For example, I doubt anybody who would have some interesting findings, that climate change turns out not to be so bad!! (I am just making this up, so just as a thought experiment) would be able to publish it in scientific journals within the current political climate. Unfortunately people in science have become more biased and political as well. Within conservation science, things going against doomsday scenarios can equally hit a lot of resistance. Social science nowadays is rife with dogmatic thinking of political correctness and biological differences are discarded for a political suitable narrative. It is therefore that scientist will go out there as individuals, representing the scientific method. We are and should not be a community who have the same political standpoint. Science has not advanced far enough that science can lead the way to a single correct political standpoint. Thanks! Great to read your stuff! I am working with a lot of conservation/ecology questions in the Neotropics and struggling with these very questions of bringing out narrative and how. By the way, model farms is very fashionable in tropical conservation work! The big problem is…. getting the right influential farmer. Very frequently the one person or few influencing everyone else don’t exist but it is a good idea in general. I was wondering if your 2×2 classification is another version of the i) fundamental vs. applied science axis (calling for passive vs. active dissemination to policymakers) and the ii) status-quo vs. paradigm-shift dialectic axis (calling for slow vs. fast policy changes). The ends-justify-the-means approach is perhaps just the result of policymakers being way too slow at steering the boat on many environmental issues? Perhaps the “honest broker” approach don’t work, or is just too slow? I’m not defending the stealth advocate, but I can see why this is happening. I enjoyed the statement “well farmers believe other farmers more than scientists, but if we can identify an influential farmer in the community and run the experiment with them and they see the improved yields with their own eyes, other farmers will believe them”. I think it is a fair statement. But my reaction was that conducting the experiment whithin the farm’s logistics and constraints should be called a “service contract”, or perhaps “farming R&D”, but no science. I find it increasingly harder to draw the line between research grants and sponsorships. Anyways, this is another topic. I personally don’t think the axes you describe line up exactly with what I am describing. I think one could do basic research that is still policy-relevant and be quite active in promoting it. And like I mentioned Pielke has his own two way classification that in some senses maps onto mine but mostly are slightly different as well. But your axes are interesting as well. I agree that scientists should be more active with their public engagement, but I think that this needs to involve less talking and more listening. I really liked the example of working with a local influential farmer. However, I think it is important not (just) because it lets the scientist ‘talk at’ more farmers via the influencer, but because the influential farmer gets to act as a (literal?) ‘gate-keeper’ and thus communicate information and insight to the scientist. This is why I suspect farmers trust the influential farmer more than the scientist: because that influential farmer is more likely than the scientists to know other farmers constraints and interests. As for keeping on our ‘scientist hat’, I feel ambivalent towards this. Hence, given that you provide a positive case, I’ll try to go for the negative case. I haven’t read Peter Adler’s post, so I might be repeating him. Sorry. Also, pardon the length. I think that when we use ‘scientist hats’, it becomes too tempting to hide behind the ‘objectivity’ of our models. What I object to is saying “the math says blah” or “scientifically, blah should happen” or “according to statistics, its blah“. I object because the moral subject of those sentences is not a person that we can blame, but math, science, and statistics. In this subtle shift of moral subject, I am pretending that there is some objective truth to which I am outsourcing my responsibility. However, using my model to generate a prediction and then saying “I predict blah blah” is alright. Also, I don’t think that as scientists we are all that good at taking a very wide view on topics. Especially the topics closest to us. We all have our pet theories or our latest paper or grant. And if we are pushed to engage actively with the public, it is tempting to use that as an opportunity to promote our latest work (we already see this in the glam-study hype cycle). And, of course, that is the work that we should have the least confidence in. There are several ways to avoid this bias. One is to only talk about really old work that wasn’t done by us. But even then we might just be pushing our favourite old zombie idea, or just finding old sources to say (or build hype for) what we just published or like working on. Two is to make ourselves available as ‘expert consultants’, where we treat each request as an independent research project where the goal is to provide an unbiased litt. review rather than something ‘new’. But here scientists might not be the best for the job. I am not sure what the role of a reference librarian is exactly, but it seems that this might align better with their strengths? Finally, we can take off our ‘science hats’ (or maybe keep them on but leave our science badges at home? ), and recognize that whatever we are saying is biased by our own (or our employers, broadly construed) personal and professional interests. We should engage actively in public discourse, but we should engage in it not from a high-horse of being scientists but as equal peers. Mindful that this is also an opportunity for us to learn things, not just to ‘share’ what we know. But this can be very scary, since after all we are more knowledgeable on our specific topics than some twitter egg, so why should we have to present arguments every time instead of appealing to our authority? I think a common theme through your comments and my thoughts is humility. Its not really on the two axes. But I think for sure something giving scientists a bad name and limited reach on the public policy arena is lack of humility. The idea that we cannot be wrong and that nobody else has a valid perspective is fatal to influencing policy. I don’t think scientists should only listen. but of course they should not only talk. And the average scientist is probably much more in danger of the 2nd than the 1st! A lot of listening is absolutely crucial to be effective. The healthiest model is to think of having a dialogue, but it needs to be a genuine sincere dialogue, not the kind of dialogue that scientists have in their classrooms which is very asymmetric nor the kind of dialogue sometimes displayed in conferences where whoever talks longest and loudest wins (for some versions of wins). Thanks for sharing such thoughtful comments!